We carry Takane and Seiko mini quartz clock movements from the Takane clock company USA. Takane and Seiko quartz clock movements, Takane and Seiko clock movements with pendulum, Takane and Seiko clock movement with pendulum and chime, Takane and Seiko westminster chime clock movements, Takane and Seiko high torque clock movements. See What's New for 2018 at Steebar.com - Seiko Clock Movement & Clock Motors for Replacement or to Build a New Clock with our movements and clock kits. We supply clock movements and clock motors from Hermle, Seiko,Takane, Young Town and more. Clock quartz motors including mini quartz clock movements, quartz clock movements with pendulum, mechanical strike quartz clock movement, high torque clock movements for long clock hands, reverse clock movements, tide movements, continuous sweep movements. From mini quartz clock motors to grandfather clock kits, we have the clock parts and supplies available for your projects. With our 32 years experience we can offer support if needed to help your clock projects success. You will find an extensive line of battery operated quartz movements to build a new clock or repair one. We have a large variety of clock movements, pendulum movements, chime movements, bim-bams, and high torque movements for driving large clock hands up to 17 1/2. Our full line of clock movements, clock dials, clock hands clock parts and tools makes the job easy.With our help you can repair or replace your clock. We stock quartz or mechanical clock movements to replace old units. When selecting a clock motor be sure the measure the depth of the hole in your clock body and clock dial. Make sure you select a clock movement with a shaft long enough to clear the hole and leave enough shaft thread to screw on the hex nut. The hex nut hold the clock motor tight to the clock body. For dials up to 3/8" thick. This quartz clock movement features step second motion which is a 'start-stop-start' motion that precisely measures the time in one second intervals. Accurate to within +/- 15 seconds per month. Quartz Accuracy - Stabilized quartz crystal assures high accuracy to within ±15 seconds per month. Reliability - A minimum number of parts (17 in entire motor) reduces wear within the motor and assures trouble-free operation. The motor is completely enclosed in its case, so dust and dirt cannot get into the motor. Compact Size - The motor is approximately 2-1/8”x 2-1/8” x 1/2”. Battery Life - The motor runs approximately two years on a fresh “AA” battery, not included. Step Second Motion - The second hand, if used, moves in exact one second steps. These Seiko motors will operate a second hand, but second hands are considered optional. See the bottom of the motor page for the link to our selection of second hands. Seiko motors require a .034 - .035 diameter second hand bushing as shown below. 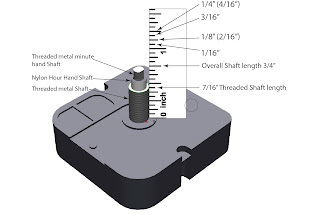 This hole size is too large for many other motors..All models have a 5/16" shaft diameter so a 3/8" mounting hole is the correct size to drill in your case. Only 6" square by 2" deep, requires one "D" battery, fits dials to 3/8" thick, 10MM shaft. Our compact “AA” battery powered miniquartz clock motor model was designed specifically for use with today’s new larger clocks. They are the most powerful quartz clock movements on the market today for larger clocks-hour and minute hand spacing! Our new “HT” series clock movements were designed specifically for use with large clock hands. The distance between where the hour and minute hands are installed has been increased! This increased distance will help to prevent longer hands from binding and leaves enough room to accommodate the counterweights that are commonly used on large minute hands. Shaft fits dials to 1/4"
With just a flip of a switch, our electronic double chime movements offer either Westminster or Whittington melodies. Also featured is a removable speaker (with generous leads)...either leave it attached behind the movement or attach it in your clock case to effect the best tone. The chimes sound every 15 minutes with the full melody and hour count on the hour. The pendulum model is supplied with an adjustable (up to 20”) single hook rod and 2-3/4” or bob (please see pendulun/bob selection for other size choices). Other features include an optional night time silence, volume control, 8 MM (5/16”) shaft diameter, optional speaker bracket, brass mounting hardware with open end nut and your choice of hour & minute hands (check index for location). A compact 3-1/4”H x 2-1/2”W x 1-1/4”D. Available with or without a pendulum, this economy movement plays the Westminster chimes of a Grandfather clock every 15 minutes and counts the hours on the hour. Model WCP-250 is available in three shaft lengths and includes an adjustable pendulum (up to 18") with your choice of a 2", 2-3/4" or 3-1/2" bob, and hour & minute hands. Size: 3"W X 4-3/4"H X 1-1/4"D. Operates on one "C" cell battery. Second hands available at slight additional cost. This is our smallest pendulum clock movement and has been "standard" in American manufacturing for years. We have changed the back of the movement so it is better able to sit flat against a wall. You can choose from 4 shaft lengths and 3 sizes of pendulum bobs. All pendulums consist of a 16" adjustable pendulum with your choice of 3 pendulum bob sizes. You can easily trim the pendulum rod to any length under 16". This quartz movement is manufactured in Germany by Hermle, one of the world’s leading manufacturers of both mechanical and battery operated movements and is known to have the finest sound of any battery powered movement available. When you select the Westminster chime mode, the chime will sound every 15 minutes and play a part of the melody. The full melody is played on the hour plus the hour count. The bim-bam mode sounds on the half hour and hour plus counts the hour. Other features include: volume control, optional night time silence, adjustable (up to 18”) pendulum, your choice of a 2”, 2-3/4” or 3-1/2” bob (please specify), operates on two “C” cell batteries, three year guarantee, fits dials to 1/2” thick. Shaft diameter is 8 MM (3/8”). The speaker may be attached to the back of the movement or positioned inside your case with the included speaker bracket to effect the best tone. Size: 4-1/4”H x 4-3/8”W x 1-5/8”D. One pair of hour and minute are included in the pricing. Please note: only the six sets of hands shown below will fit this movement. Second hands are available at a slight additional cost, check index for location. We permanently programmed an hour only Westminster and Whittington chime with hour count, then gave it a remote 2" speaker for good sound quality, and an increased the volume level so that this is now the loudest chime movement we have. The recordable chime feature is totally unique. Whatever 10 second sound you record will play every hour on the hour. The model has a built in microphone and a 1/8" jack if you would like to use a higher quality microphone for your recording, or patch into another device The connecting wires are 12" long. Synchron clock movements provide for a sweep second hand and split second accuracy for either consumer, industrial, or laboratory clocks and other time keeping applications. The type "C" movement is a brass movement with smooth continuous hand movement. Active lifetime routinely exceeds 20 years. Self-resetting is an option with the "C" movement for customers who need to synchronize multiple clocks to a single master clock.